Oblivious RAM (ORAM) is a powerful cryptographic building block that allows a program to provably hide its access patterns to sensitive data. Since the original proposal of ORAM by Goldreich and Ostrovsky, numerous improvements have been made. To date, the best asymptotic overhead achievable for general block sizes is \(O(\log ^2 N/\log \log N)\), due to an elegant scheme by Kushilevitz et al., which in turn relies on the oblivious Cuckoo hashing scheme by Goodrich and Mitzenmacher. In this paper, we make the following contributions: we first revisit the prior \(O(\log ^2 N/\log \log N)\)-overhead ORAM result. We demonstrate the somewhat incompleteness of this prior result, due to the subtle incompleteness of a core building block, namely, Goodrich and Mitzenmacher’s oblivious Cuckoo hashing scheme. Even though we do show how to patch the prior result such that we can fully realize Goodrich and Mitzenmacher’s elegant blueprint for oblivious Cuckoo hashing, it is clear that the extreme complexity of oblivious Cuckoo hashing has made understanding, implementation, and proofs difficult. We show that there is a conceptually simple \(O(\log ^2 N/\log \log N)\)-overhead ORAM that dispenses with oblivious Cuckoo hashing entirely. We show that such a conceptually simple scheme lends to further extensions. Specifically, we obtain the first \(O(\log ^2 N/\log \log N)\) Oblivious Parallel RAM (OPRAM) scheme, thus not only matching the performance of the best known sequential ORAM, but also achieving super-logarithmic improvements in comparison with known OPRAM schemes. 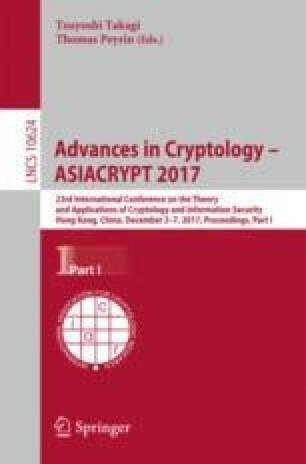 The full version of this paper is available on Cryptology ePrint Archive . This work is supported in part by NSF grants CNS-1314857, CNS-1514261, CNS-1544613, CNS-1561209, CNS-1601879, CNS-1617676, an Office of Naval Research Young Investigator Program Award, a Packard Fellowship, a DARPA Safeware grant (subcontractor under IBM), a Sloan Fellowship, Google Faculty Research Awards, a Baidu Research Award, and a VMWare Research Award.